Following confirmation by Spain’s Interior Minister that police fired rubber bullets in an attempt to stop migrants from entering the Spanish enclave of Ceuta, which may have contributed to at least 11 drowning deaths, Amnesty International is calling for a full, effective and independent investigation. The drowned migrants were among some 250 sub-Saharan Africans who had been attempting to reach Spanish soil on 6 February by crossing into Ceuta via the sea from neighbouring Morocco. “This loss of life is appalling, and the Spanish authorities must come clean on what happened – particularly as the Minister’s version of events contradicts earlier official statements. They must determine what went wrong and bring those responsible to account as a matter of urgency,” said Jezerca Tigani, Deputy Europe and Central Asia Programme Director at Amnesty International. On Thursday evening, in a statement to Spanish Congress, Interior Minister Jorge Fernández Díaz confirmed that members of the Spanish Civil Guard used anti-riot equipment, including rubber bullets, to stop the migrants swimming towards Ceuta on 6 February. At least 11 migrants drowned and a group of 23 people who reached the shore were forced back across the border to Morocco without formal procedures. In his speech, the Minister said that the riot gear had been used in a way that would ensure that people in the sea were not hit. “Regardless of whether any of the migrants were hit, it will be up to an independent investigation to determine whether the Civil Guard and border authorities acted appropriately. The results of any such investigation must be made public, and anyone responsible for human rights violations brought to justice,” said Jezerca Tigani. The Spanish Minister of Interior has admitted that 23 individuals were handed over to Moroccan authorities by the Spanish Civil Guard, after being apprehended on Ceuta’s shores. He claimed that this was lawful, arguing that the migrants had not arrived in Spanish territory. “Regardless of their location, the 23 individuals were clearly under Spanish jurisdiction once apprehended by the Spanish Civil Guard officers. The actions of the Spanish officials can be described as a push-back operation, the practice of summarily turning back a group of migrants across the border. Summary deportations of migrants or push-backs without giving them a chance to challenge their deportation is a direct breach of Spanish, EU and international obligations; so is the rejection of asylum-seekers at the border,” said Jezerca Tigani. 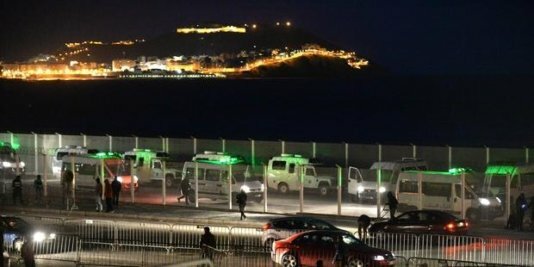 Amnesty International and local NGOs have documented a number of previous incidents where Spanish authorities appear to have summarily deported migrants, asylum-seekers and refugees from the Spanish enclaves of Ceuta and Melilla, both of which share a land border with Morocco. The organization is not aware of any investigation into these incidents. A standing agreement between Spain and Morocco to return migrants who cross into Spanish territory appears to be facilitating some of the deportations, in breach of international human rights standards.